For Indians, there are many figures of repute who go down in history as freedom fighters. Gandhi and Nehru, Bose and Bhagat Singh are just a few of the brave souls who took on an invading force. But even before all these great men comes Manikarnika. Those who do not know the name are likely to remember the children’s poem by Rani Laxmibai with the now epic line “Khoob Ladi Mardani Woh To Jhansi Wali Rani Thi”. 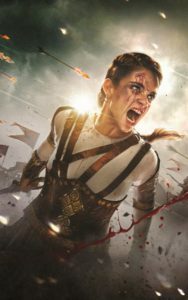 Kangana Ranaut reprises the role of Jhansi Ki Rani and throughout teasers and trailers shows a woman who stood where others fell and bravely fought a foreign invader. From a musical perspective, this is thus a film heavily steeped in patriotism, mixed in with the human story that we might get in any biopic, so we can expect a combination of stirring and pride filled renditions with an odd soft sound to remind the audience that Manikarnika is still just a person. To get this right, Shankar Ehsaan and Loy have been invited to put together this 8-song soundtrack together. Shankar Mahadevan brings his well-known voice to the mic for the album opener and ender Bharat. While in a male voice in both versions, this is a mother’s song to her child with the line “Mein rahu ya na rahu Bharat yeh rehna chahiye”. The backing of ektara and flute and the addition of ghungroo and violins round off this image, giving the song a lullaby quality but not enough to put anyone to sleep. Drums are added about half way to build the sound and a mixed chorus makes it a song for all, a sort of rallying cry for all those in love with their land. In Version 2 which ends this album, there is a male narrator of the lyrics who recites each line before sung by Shankar Mahadevan which while isn’t much different, certainly brings the lyrics to the forefront and drives the patriotism within. The next two songs can be paired together as they bring out the ill-treatment of the people which will eventually force the hand of Manikarnika to act against British forces. Vijayi Bhava and Bolo Kab Pratikar Karoge use the patriotism built by Bharat and remind the audience that this was a tough time to be an Indian. ‘Vijayi Bhava’ tells the tale of loss of hope within the people, who can feel their own presence slowly but surely being smashed by the emergence of the British empire. ‘Bolo Kab Pratikar Karoge’ takes this feeling to the next level with the lyrics “Pooch raha astitva tumhara kab tak aise var sahoge”. Choruses are employed in both as the voice of the people, however cleverly in some parts they are a cheer squad, in others accusers imploring Jhansi Ki Rani to stand up to those who would hurt their pride. Both employ powerful drums and horns with the soft violins to represent the people. The real difference between the two is the singers. Shankar Mahadevan brings a softer but urgent tone to ‘Vijayi Bhav’, whereas Sukhwinder Singh brings his trademark style to ‘Bolo Kab Pratikar Karoge’ to really hit it home. As expected amid all the anger and patriotism there is still a need to remember that before being people of high status, these were just people. So, we have Rajaji and its female equivalent Taki Tami. Both are softer tones, simple, interesting and pleasant tunes. Both sung by Pratibha Singh Baghel who manages to find different voices for her part in each. ‘Rajaji’ is a playful song, sometimes teasing, sometimes warmly hugging Rajaji who seems lost in love. Gentle earthen instruments sit behind and let the singer take full charge. Ravi Mishra singing on behalf of the male, gives a version of a strong but fair Raja turning into a lovestruck fool. ‘Taki Tami’ seems to be in the events of the wedding, taking a purely female perspective on the events of the day. A mandolin is applied to describe the fleeting excitement that escapes during what is both a nervous but also patient time. In between these two love songs comes the power that is the Shiv Tandav. As is traditional, and the song being likely used as part of a festival, only dhumroo and big drums accompany a 2-layer chorus. Shankar Mahadevan takes the mic to sing about his namesake with traditional lyrics often used to celebrate the coming of Shiva. Nothing special in this song, but you wouldn’t want to play with this too much anyway. Of course, no Bollywood film is complete without an item song so Prajakta Shukre, Shrinidhi Ghatate, Siddharth Mahadevan and Arunaja come together to deliver Dankila. Drums, singers and dance are in abundance here. Horns and choruses keep the bridges alive and moving, but this is a sort of song that washes over a listener without leaving any distinguishing features. Its fun, those who like to dance certainly will and then, as a cinemagoer, its back to the film world. Twenty years after the death of Manikarnika, Colonel Malleson wrote in the History of the Indian Mutiny: “Whatever her faults in British eyes may have been, her countrymen will ever remember that she was driven by ill-treatment into rebellion, and that she lived and died for her country, We cannot forget her contribution for India.” When even the enemy is giving plaudits and telling the world about the exploits of Jhansi ki Rani, there is certainly something to the story. The album fits into this well, with the 2 versions of Bharat and the songs of empowerment delivering strong messages to the audience both of the world they are being taken to as well as the feelings of those living in it. Remembering that Manikarnika is just 1 person in all this, we are treated to 2 love songs which are soft and melodious as needed. However, once the film is over there isn’t anything to remind listeners of these songs. Neither do the lyrics resonate with a modern audience as modern Indians whether in India or outside are not in a state of oppression.